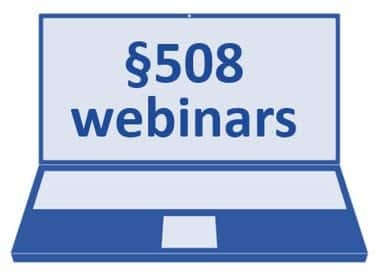 Section 508 Webinars — The next webinar in the Section 508 Best Practices Webinar Series will take place May 29 from 1:00 to 2:30 (ET) and cover strategies for meeting the updated 508 Standards in federal procurements. Presenters from the General Services Administration (GSA) will review available tools and resources, such as an Applicability Checklist on the revised standards, a solicitation conformance template, a new conformance reporting tool for vendors, and GSA’s Accessibility Requirements Tool. For more details or to register, visit www.accessibilityonline.org/cioc-508/session/?id=110667. The Section 508 Best Practices Webinar Series provides helpful information and best practices for federal agencies in meeting their obligations under Section 508 of the Rehabilitation Act which ensures access to information and communication technology in the federal sector. This webinar series is made available by the Accessibility Community of Practice of the CIO Council in partnership with the Access Board.